Parallels Remote Application Server can be configured to accept connections placed from Parallels RDP Clients against a Parallels Client SecureGateway over SSL. 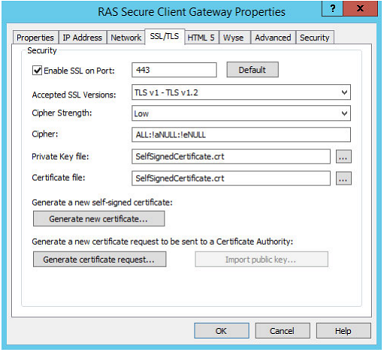 Such a configuration requires an SSL Certificate to be imported within the RAS Console. Parallels Remote Application Server allows configuration of both Self-Signed certificates and signed SSL Certificates obtained from a certificate authority.Self-signed certificates are ideal for testing purposes. The certificate is configured from within the Gateway properties of the Client Secure Gateway users are connecting through. Input the relevant information and click save. The Self-Signed Certificate is automatically imported and ready to be used.